Purchased puff pastry adds to the ease of this dessert recipe, but the real star is the fillingthe perfect pairing of sweet apples and tart cranberries. Homemade icing rounds out this crowd-pleasing potluck pie. Preheat oven to 375 degrees F. Lightly grease a 15x10x1-inch baking pan; set aside. For filling, in a large bowl stir together apples, granulated sugar, dried cranberries, flour, and cinnamon; set aside. On a lightly floured surface, unfold one sheet of pastry. 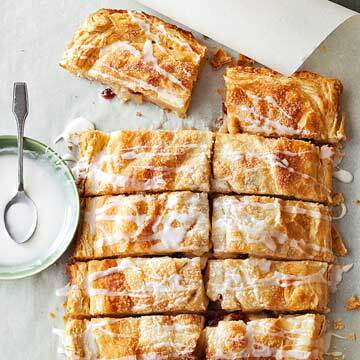 Roll pastry into a 15x10-inch rectangle. Transfer to the prepared baking pan. Spread filling over pastry to within 1 inch of the outside edge. Unfold the remaining sheet of pastry; roll into a 16x11-inch rectangle. Place pastry on top of filling. Moisten edge of bottom pastry with milk. Fold bottom pastry over top pastry; gently press edges to seal. Using a sharp knife, cut slits in pastry. Brush top lightly with milk and sprinkle with coarse sugar. Bake for 50 to 55 minutes or until filling is bubbly and pastry is puffed and golden. If necessary to prevent overbrowning, cover tart loosely with foil for the last 10 to 15 minutes of baking. For icing, in a small bowl stir together powdered sugar, vanilla, and salt. Stir in enough of the 4 to 5 teaspoons milk to reach drizzling consistency. Drizzle icing over warm tart. Cool completely on a wire rack. Cut into bars.